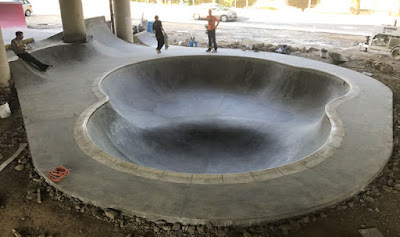 The new bowl in Newport Skatepark nears completion. Tuesday, August 15, is the Grand Opening. No, that’s not a swimming pool they’ve been building under the 471 bridge in Newport. 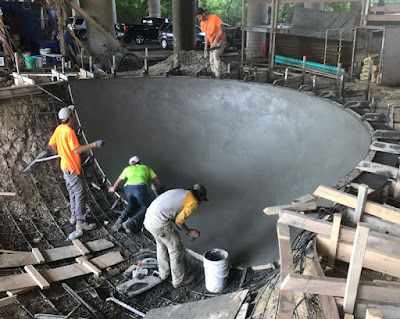 It’s the latest feature for the Newport Skatepark, a large, smooth concrete bowl designed to give skaters the space to practice carves and grinds and other tricks of the trade. Tonight, organizers will celebrate the completion of the bowl with a ribbon cutting and Grand Opening starting at 6 p.m. The space under the bridge across from the Newport High School football field on Sixth Street offers skateboard enthusiasts optimal conditions — smooth concrete away from traffic and obstructions. Skaters were using the space unofficially since about 2008. The first owner of Newport’s The Galaxie Skateshop, Andrew Martin, saw the potential and worked with others in the community to clean it up and add ramps and other features. When Gary Collins took over the shop in 2010, he continued with the project, working with the community to raise funds to keep the park going, add features and expand. 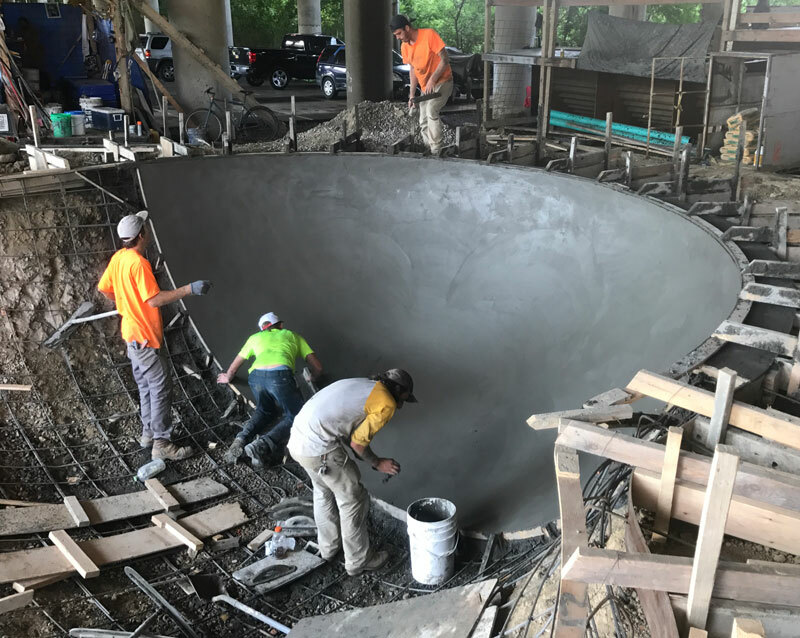 The bowl was built with the help of Hunger Skateparks. For the new bowl, Collins enlisted the help of a skate bowl construction company, Hunger Skateparks of Bloomington, Indiana. "These bowls are constructed in the same way as in-ground swimming pools, just sculpted differently," says Collins. "It was awesome to work with professional builders, a real learning experience for us." All features in the park were built with volunteer labor. Skateboarders have had to be a resourceful lot, Collins explained, because for a long time the sport was frowned upon and misunderstood. Skaters had to find their own places to practice and have fun. Skating can be hard on the body, Collins said, but anyone of any age in good physical shape can learn. The park draws between 40 and 100 people a day, he said. Collins said he’s very happy with the support he’s received in the community. 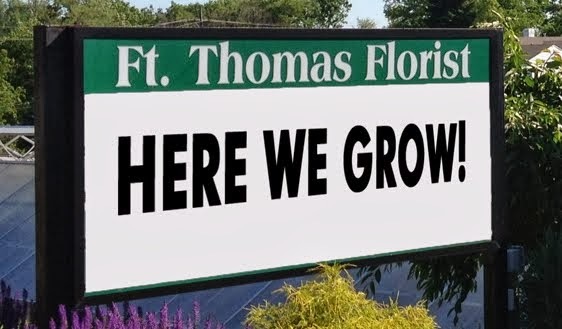 "I really want to say thanks to the city of Newport, especially Mayor Jerry Peluso, City Manager Thomas Fromme and all the city commissioners for their support and for allowing us to grow." Newport Commissioner Ken Rechtin said "It’s exciting to see individuals and business owners take an active role in providing recreational opportunities for the community. This a positive and permanent development, quite an investment. A real legacy is being created here." Collins and others raise money all year through a DIY Skatepark funding page and with help from ReNewport, an organization devoted to supporting community projects. The next fundraiser will be a bake sale on Sunday, August 27, at the Cheapside Café in Cincinnati. A ramp for demonstrations will be set up outside the café. Funds raised provide upkeep as well as new features and artwork. The park has been working with two well-known area artists, Ali Calis of the Able Project and Derek Toebbe of Artworks, an organization known for many Cincinnati-area murals. The Galaxy Skateshop, located at 625 Monmouth Street in Newport, will celebrate its tenth anniversary in October, and a second location in Cincinnati’s Northside neighborhood has been going strong since 2014.